The ROM SAF is pleased to announce the release of the first version of offline radio occultation (RO) data generated from the Metop satellite mission. The data covers the time period from January 2017 up to the present. The figure shows an example of two tropopause temperatures (based on cold point and lapse rate definitions) compared to ERA-Interim in the narrow tropical region. We are pleased to announce that the ROM SAF Metop-C GRAS Level 2 products (GRM-60 to 65) are operational and that we have initiated the dissemination both on GTS and EUMETCast. This report covers the 7-month period June -- December (H2) of 2018. The ROM SAF level 2 NRT refractivity product has been disseminated via GTS and EUMETCast with operational status since (i) 1st of February 2010 after being disseminated with pre-operational status since March 2009 (GRM-01 for Metop-A) (ii) 17th of June 2014 after being disseminated with demonstration status since 10th December 2012 (GRM-40 for Metop-B). The ROM SAF level 2 NRT 1D-Var products have been disseminated via GTS and EUMETCast with (pre-)operational status since 22nd July 2014 for both Metop-A and Metop-B. The ROM SAF website has been operational since 2009 and provides access to the ROM SAF help desk, downloading of the ROPP package and monitoring of product quality. The ROM SAF level 3 climate products based on COSMIC RO data was released the 10th of June 2013 and was updated the 16th of March 2015. The products are available on the ROM SAF website together with the ROM SAF level 3 climate monitoring plots. The ROPP package, ROPP version 9 was released the 28th of February 2017 and is available on the ROM SAF website (the previous version of the ROPP software is also available on the ROM SAF web site). The last operations review (OR10) was held on the 17-18th of May 2018 at DMI. The ROM SAF is pleased to announce the release of the first version of Climate Data Records generated from a reprocessing of radio occultation (RO) data. The CDRs are based on RO data from the Metop, CHAMP, GRACE and COSMIC RO missions and cover the period 2002-2016. 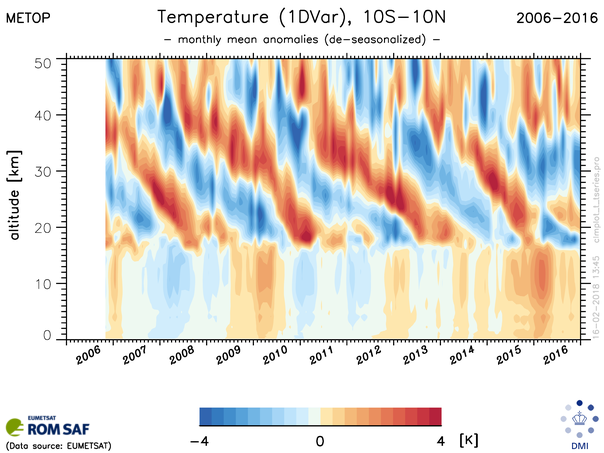 The figure shows an example of the QBO signal visible in the de-seasonalized temperature in the tropical latitude band. These data can be displayed by selecting FY-3D/CMA from the drop-down list. Early results indicate that the quality of the data is broadly similar to that from the FY-3C satellite. These can be displayed by selecting either GRAS-C/DMI or GRAS-C/EUM from the drop-down list. Early results indicate that the quality of the data is similar to Metop-A/B. Users should be aware that Metop-C processing is in pre-operational status, therefore data outages and changes may occur without notice. The KOMPSAT-5 satellite was launched in 2013 into a sun-synchronous polar orbit. Recently UCAR have started processing the RO data which was being produced by this satellite. These data are made available via FTP from the CDAAC website. The observations are processed twice per day, with a delay of a few hours, which means that they are not currently suitable for operational implementation. Overall the quality of this data is excellent - approximately as good as from the COSMIC-1 satellites. There is no evidence of systematic biases in the data. The standard deviation of differences between the observation and NWP model background is generally comparable to that of other satellites, except in the lower-stratosphere where they are slightly larger. Due to the orbital period the satellite produces occultations in a regular pattern across the globe. In the one-month period considered we received 12901 observations (approx 440 per day) which compares with 16874 for Metop-A and 7956 for COSMIC-1 FM1. ROPP-9.1 is a minor release of the ROM SAF’s Radio Occultation Processing Package (ROPP). This report summarises some of the main science changes in ROPP 9.1. These include 1) modifications for GNOS processing, 2) improvements in the wave optics propagator and 3) changes to the L1/L2 bending angle forward models. Possible developments for future ROPP releases are discussed briefly. The physical basis of the wave optics simulation code included in ROPP-9 is described. The ROPP wave optics simulation code is based on a multiple phase screen (MPS) approach which is well known, and so it is only reviewed briefly. A new method for computing the phase and amplitude at the LEO satellite, given the phase and amplitude at the final phase screen, is described in detail. More specifically, it is shown that the solution at the LEO can be computed efficiently in terms of standard Fresnel integrals. The simulations are tested by inverting the phase and amplitudes with a Full Spectrum Inversion (FSI) approach to produce bending angle profiles, and then comparing these with a one-dimensional geometrical optics forward model. Some errors for large bending angle cases in the lowest 2 km are identified, and improvements for implementation in ROPP-9.1 are presented. ROPP-9 users can contact S. B. Healy (sean.healy@ecmwf.int) directly for more information relating to the ROPP-9.1 changes. The report describes the results of some numerical experiments designed to investigate the feasibility of carrying out 1D variational retrievals using dual or single frequency radio occultation bending angles, rather than the usual ionospherically corrected ‘neutral’ bending angles. A detailed analysis of the results of carrying out these experiments on two example radio occultation profiles is followed by a statistical analysis of the results of doing so on 3500 consecutive profiles observed by the GRAS instrument on Metop-A. 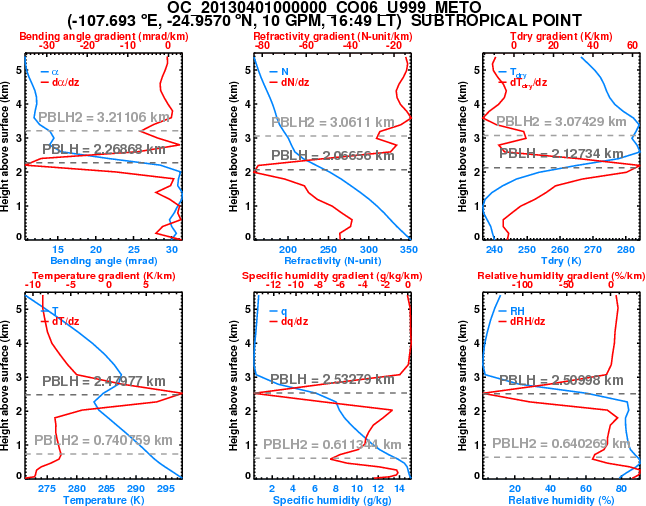 The retrieved ionospheric parameters are briefly reviewed. Further work is suggested. Comparisons of ROM SAF Metop/GRAS RO and hyperspectral IR sounders CrIS and IASI are made in brightness temperature (BT) space for channels sensitive to the ~10-200 hPa region over the years 2015-2016. ROM SAF RO stochastic temperature error estimates are converted to BT units and used to assess the agreement between the RO and IR sounders. Seasonal, zonal results show general agreement of the ROM SAF background and wet temperatures with the IR sounders with exceptions for the tropical zones. The dry temperature results showed disagreement with the IR sounders for all channels with contributions above ~70 hPa. ROM SAF NRT data monitoring now includes data from the GNOS instrument onboard the FY-3C satellite operated by CMA. See http://www.romsaf.org/monitoring/. Details of the processing can be found in ROM SAF Visiting Scientist Report 32. A set of refractivity profiles generated from the ECMWF NWP model as part of a EUMETSAT Study is made available from the ROM SAF web pages. These profiles can be used e.g. to do realistic wave optics GPS radio occultation measurements. Please note that these profile data are not part of the operational ROM SAF product portfolio. The dataset consists of 55 profiles of refractivity, N, as a function of altitude, N(z). The profiles were originally derived from ECMWF forecasts on 91 levels from the surface to ~80 km. The profiles were selected with the aim of finding some challenging cases for the GPS receiver. Consequently, the dataset includes some large gradients and ducting cases. The profile dataset is described more fully in a technical report available with the dataset. This dataset can be used with the ROPP-9 wave optics propagation tool. The ROM SAF is pleased to announce the ninth full release of the software deliverable 'ROPP', Version 9.0. The main changes from the previous release, Version 8.0, are as follows. 1) The introduction of a facility to diagnose the Planetary Boundary Layer Height (PBLH) from profiles of bending angle, refractivity and dry temperature, as well as from model fields of temperature, specific humidity and relative humidity. 2) The introduction of a Wave Optics Propagation tool, which allows users to diagnose the excess phase delay incurred by a radio signal as it passes through a specified refractivity field. 3) Generalisation of the interface to the 1D Forward Model. Full details are provided in the Change Log on the ROPP download site. EUMETSAT's Polar System-Second Generation (EPS-SG) satellites will continue and enhance the currently flying EPS satellite observations from about 2021 onwards. The Radio Occultation (RO) instrument on the satellites is primarily designed to sound the lower neutral atmospheric layers, from about 80 km downwards (similar to the current EPS/GRAS instrument). But they also include the possibility of sounding the ionosphere up to 500 km. In order to compile the interests and suggested requirements of ionospheric data users, a survey was conducted among space-weather, ionospheric, GNSS, and other scientific communities that might be interested in such EPS-SG RO products. The users were explicitly asked about the sampling, precision and latency requirements, their preferred formats and dissemination channels, or the application they target, among other questions. In addition, they were invited to read the information about the EPS-SG RO mission provided with the questionnaire and to comment on potential limitations identified and their impact in the user’s application or operations. A ROM SAF report has been prepared to present the survey and to summarize its outcome. It shows that the range of applications of such data sets would span beyond space-weather and ionospheric monitoring applications, with some specific targets of interest for other EUMETSAT SAFs, and are also relevant for other RO missions. Regarding EPS-SG, the suggested ionospheric user requirements would generally be met, with restrictions on latency (which is driven by the neutral atmospheric requirements) aspects for some space-weather operational applications. Version 9.0 of the ROM SAF's Radio Occultation Processing Package (ROPP9.0), will include tools to diagnose Planetary Boundary Layer Height (PBLH). These are defined as the locations of maxima in the vertical gradients of bending angle, refractivity, dry temperature, model temperature, model specific humidity and model relative humidity. Prototype datasets containing the various ROPP-calculated PBLHs, for every available profile in March, April and May 2013 (around 194 000 profiles in total), are now available for study and research by interested users. This figure shows the diagnosed PBLHs from various fields for an occultation situated over the marine stratocumulus deck off the west coast of South America. 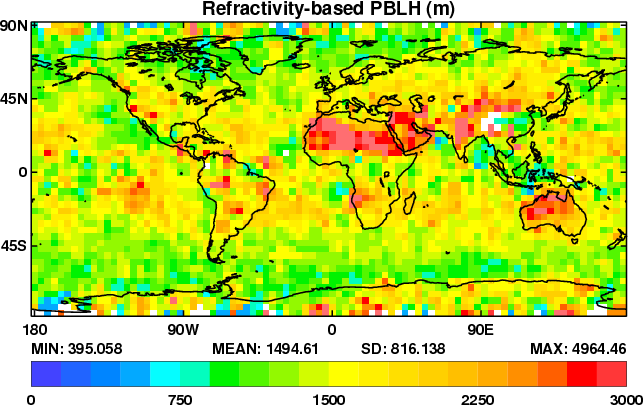 This figure shows a map of the mean refractivity-based PBLH during April 2013. Documentation: ROPP APPS User Guide (available on request until ROPP9.0 is released), ROM SAF Report 24, ROM SAF Visiting Scientist report VS30. The study addresses the problematics of gravity waves (GWs) retrieval from GNSS radio occultation (RO) measurements and projects it onto the demonstration ROM SAF CDR Version 0 data set, based on CHAMP, GRACE, COSMIC and Metop-A observations altogether spanning 14 years. A review of the existing methods for retrieving GW parameters (potential energy, wavelengths and momentum flux) as well as of their capacities and limitations is provided. After a description of the analysis applied to the ROM SAF CDR V.0, we present a new 14-year global climatology of the two essential GW parameters: potential energy and dominant vertical wavelength. The potential energy was derived for two vertical wavelength spectral ranges. The obtained geographical distribution, annual cycle and temporal variability of GW activity is interpreted under consideration of the known GW sources (flow over orography, convection, jet stream instabilities, planetary wave activity) and GW propagation or filtering in the background flow. After analysis of the statistical errors associated with different data gridding options, a set of recommendations for the future ROM SAF L2 and L3 products relevant for GW analysis is provided. The ROM SAF is pleased to announce the first prototype release of the software deliverable 'GBGP', Version 1.0. GBGP (Ground-Based GNSS Processing) is a package of software, data files and documentation whose principal purpose is to encode the E-GVAP 'COST-format' data (ground-based GNSS observations) to WMO-standard BUFR for dissemination to NWP users via the GTS. The package also contains some pre-converter tools to output COST-format files from other formats. The GBGP package is essentially a re-branding of the E-GVAP 'GWV' and 'GWVBUFR' export packages written by the Met Office; GBGP now replaces those packages. The ROM SAF will take over responsibility for maintaining this package alongside the existing ROPP software. This release is designated 'prototype' because the software has not yet undergone the ROM SAF's formal release procedure which includes code review, a comprehensive test suite, independent beta-testing, a Delivery Readiness Inspection Review and formal approval to release by the ROM SAF Steering Group. Nevertheless, the application code is effectively the same as that in the E-GVAP packages which has been in regular use for many years. The refactored code has been informally tested, is known to be highly portable and is being used in the Met Office for operational dissemination of E-GVAP GB-GNSS data in BUFR via the GTS to global NWP users. This report reviews the calculation of undulation – the difference between the (WGS-84) ellipsoid and the (EGM96) geoid – in ROPP. The undulation value at the nominal RO profile location is subtracted from the Impact Height to obtain the height with respect to the geoid of any point in the profile. For practical purposes, the resulting geoid height can be considered to be the same as height above mean sea level. The current method of calculating undulations (or geoid heights in ROPP) uses a full spherical harmonic expansion which is both complex and cpu-intensive. An alternative grid interpolation method has been developed which is shown to be significantly simpler in code terms and so substantially quicker to run, and without any practical loss of accuracy when compared to the present full calculation method. The interpolation method is proposed to replace the current undulation code in ROPP. A new paper in Met Apps (doi:10.1002/met.1559) by L. Sapucci and colleagues at CPTEC, Brazil, describes the use of the ROPP refractivity forward operator in the LETKF data assimilation system which is under development at CPTEC. They report beneficial impacts in the Southern Hemisphere and Tropics, and particularly over South America. They take this last result as a sign that GPS-RO data is more significant in areas where the forecast model is already performing well. A slight reduction in Northern Hemisphere skill, as measured by the anomaly correlation coefficient, is attributed to the impact of RO observations on the quality control of conventional observations. Mid-level temperature forecasts from analyses incorporating GNSS-RO observations verify better against radiosonde observations than those from analyses constructed without GNSS-RO observations. One notable feature of Sapucci et. al.’s implementation is that the ROPP refractivity operator is used largely intact, without modification, so that future developments in the operator should be easy to introduce into their data assimilation system. This report concerns the Planetary Boundary Layer Height (PBLH) diagnostics that have been implemented in the ROM SAF’s Radio Occultation Processing Package, ROPP. Algorithms for calculating the PBLH are briefly described. PBLHs calculated from six different profile variables — three ‘observation fields’ and three ‘model fields’ — are compared and contrasted, both by profile-by-profile scrutiny of selected examples, and by inspection of the average of a month of occultations. PBLHs derived from forward modelled background fields are also briefly considered. Tentative conclusions are drawn before possible future work is considered. The report describes a wave optics based algorithm to extract the reflected bending angle profiles from radio occultation data. Related to this, a methodology to identify and flag reflected signals in RO data is developed. The developed method is validated by comparing it to a database with reflections for COSMIC data (Reflection flag data). The ROM SAF is now releasing an update of the gridded data based on data from the US-Taiwanese satellite mission FORMOSAT-3/COSMIC. The monthly mean time series now covers the period from September 2006 to June 2015. This ROM SAF gridded data (products GRM-17 to 21) consists of zonal monthly means of bending angle, refractivity, temperature, humidity, and geopotential height, on a 5 degree by 200 meter latitude-height grid. 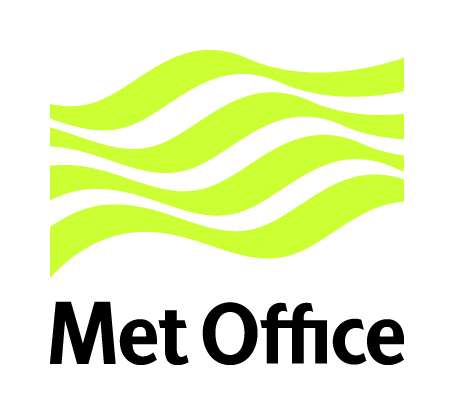 The monthly data are delivered as CF compliant netCDF files that also incorporates related data: data numbers, error estimates, and comparisons to the ECMWF operational model fields. The data can also be viewed on the ROM SAF Climate Monitoring pages, which includes time series plots for the full length of the gridded data, as well as various quality indicators. User documentation and access to the gridded data are available at the Product Archive. Since January 4, 2016, the ROM SAF data archive includes a list of RO events flagged with the occurrence of reflected signals. This is a prototype product and is provided for demonstration and research purposes. The original set contains more than 4 million COSMIC RO events, since 2006 to the beginning of 2014, and some of 2015. A ROM SAF report has also been published on the ROM SAF website to facilitate the understanding of the flag, methodology used to determine the presence of reflected signals, and its validation. The report also presents some statistics of the occurrence of reflected signals in RO, their geographic and seasonal behavior, an initial investigations about the potential nature of their occurrence (instruments, scattering surface and/or atmospheric conditions). The ROM SAF is pleased to release a visiting scientist report by Jordis S. Tradowsky, Bodeker Scientific, New Zealand. Measurements of atmospheric temperature have been made for decades and nowadays radiosonde (RS) and radio occultation (RO) measurements are used to anchor the temperature in numerical weather prediction (NWP) models. However, the impact of the high quality RO data might be limited due to opposing biases between the observation types. Therefore, for better exploitation of highly accurate RO measurements an improved bias correction in RS temperatures is needed. Here we use a novel method to calculate the RS temperature bias on a station-by-station basis for different solar elevation angle ranges. The temperature bias corrections are calculated using fields from the Met Office Unified Model as a transfer medium. The results of this project show that RS temperature biases vary from station-to-station and are highly affected by the position of the sun. The results are intended to be used in a forecast impact study and could afterwards be implemented into operational weather forecast systems, where they would need to be updated on a regular basis. The results of the User Survey will be compiled into a report which will be made available at the website. The ROM SAF is now releasing an update of the gridded data based on data from the US-Taiwanese satellite mission FORMOSAT-3/COSMIC. The monthly mean time series now covers the period from September 2006 to April 2014. The ROM SAF is pleased to announce the eighth full release of the software deliverable 'ROPP', Version 8.0. The changes from the previous release, v7.0, are: an improved vertical interpolation scheme in the refractivity and bending angle forward models, which has been found to reduce anomalies in O-B statistics seen with coarsely gridded model data; the introduction of a facility to forward model, and make 1dvar retrievals using, L1 and L2 bending angles (by means of a simple model ionosphere); acceleration of the tool that extracts background profiles from GRIB files; the provision of informative shell return codes from all the tools; increased flexibility in the output levels of the 1d forward model; more robust and user-friendly automatic testing of the modules during the build; and numerous technical developments and small bug-fixes. Added the possibility to append comments/replies while the enquiry is "open". These intermediate comments/replies are private; i.e., only the user and the ROM SAF team are able to see them. Status changed to only two states: open and closed (when there is a final answer). Multiple attachments: Attachments can be uploaded in the enquiry form and with the possibility to append multiple attachments. Attachments can be added during all stages: initial enquiries, comments/replies and answers. Enhanced helpdesk view using fieldsets. We are pleased to announce the improvement of QC procedure for level 2a products and the dissemination of NRT temperature, specific humidity, pressure and surface pressure products from the Metop-A and B satellites. We are pleased to announce the operational dissemination over EUMETCast of the ROM SAF Near Real Time Refractivity Profile derived from Metop-B/GRAS data (GRM-40). It has been available since 17 June 2014. The NRT refractivity product contains a profile of neutral refractivity as a function of height (geometric and geopotential) above the EGM-96 geoid. Access to this product will be automatically provided for EUMETSAT Member/Cooperating State NMS and registered manufacturers. We are pleased to announce the upgrade of the Near Real Time Level 2a Refractivity Profile Product derived from Metop-B/GRAS data (GRM-40) to full operational status. The product has since 20 June 2013 been disseminated in BUFR format over GTS with unchanged quality. There is no change in the quality of the product as a result of the upgrade to full operational status. We are pleased to announce the trial dissemination over EUMETCast of the ROM SAF Near Real Time Refractivity Profile derived from Metop-B/GRAS data (GRM-40), to commence on 20 May 2014. Access to this product will be automatically provided for EUMETSAT Member/Cooperating State NMS and registered manufacturers. Following a successful trial, it is planned to make the product available to the wider EUMETCast User community. The ROM SAF is pleased to announce the seventh full release of the software deliverable 'ROPP', Version 7.0. The main change from the previous release, v6.1, is the inclusion of a tool to diagnose tropopause heights from profiles of bending angle, refractivity, dry temperature or background temperature. The first two are derived from the covariance transform of the bending angle or refractivity profile; the last two from the lapse rate (and cold point) of the temperature profile. Quality control flags help the user to assign the appropriate level of confidence to the diagnosed tropopause heights. All user documentation has been reviewed and updated. Details of all changes are available together with the updated software on the ROPP download website. The ROM SAF is now releasing an update of the gridded data based on data from the US-Taiwanese satellite mission FORMOSAT-3/COSMIC. The monthly mean time series now covers the period from September 2006 to December 2012. The data can also be viewed on the ROM SAF Climate Monitoring pages , which includes time series plots for the full length of the gridded data, as well as various quality indicators. The ROM SAF is seeking a Visiting Scientist to perform the tasks described in this PDF file. The duration is estimated to be three months to be carried out in the period from September/October to December 2013. The successful candidate should spend three weeks at the Danish Meteorological Institute (DMI) in the beginning of this activity and the remaining time at the home institute. The payment for this Visiting Scientist Activity (VSA) will consist of half a salary compensation for ten weeks to be paid to the home institute. In addition, the ROM SAF will pay the trip and per diem for the three weeks stay at DMI. If you are interested in this Visiting Scientist activity, please email a brief application and short CV to the ROM SAF Helpdesk (email) before 24 July 2013. The ROM SAF is pleased to announce the release of a new set of gridded data, based on data from the US-Taiwanese satellite mission FORMOSAT-3/COSMIC. Launched in April 2006, the satellites still continues to make important contributions to the set of global RO climate data, even though their 5-year design life time ended in 2011. 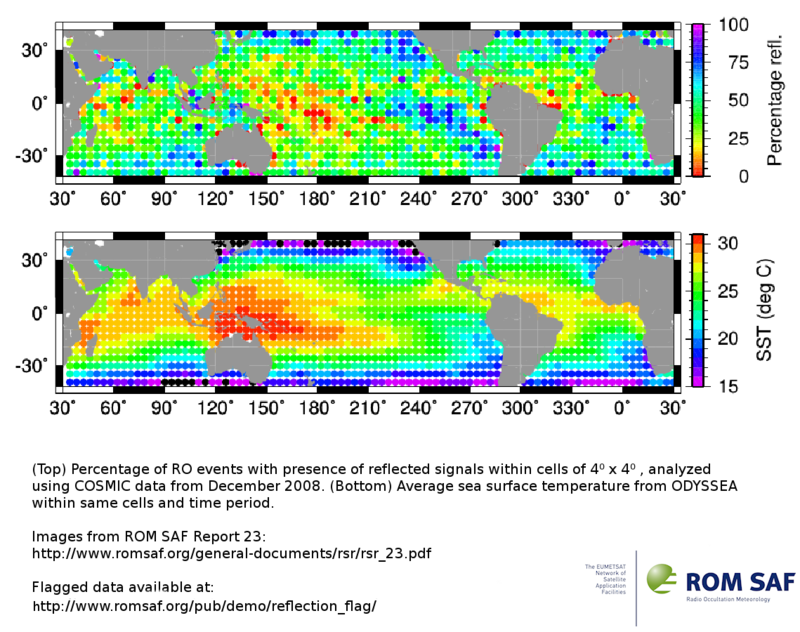 Starting on June 10, 2013, the ROM SAF gridded data includes monthly data from January 2008 to June 2012. During the following weeks, the data set will be extended back to August 2006 and forward into 2013. After that, the gridded data will be continuously updated, lagging the stream of new observational data with less than 6 months. The ROM SAF is pleased to announce an update to the sixth full release for the software deliverable 'ROPP', Version 6.1. The main changes from the previous release, v6.0, are as follows. (1) A tool to read background profiles of RO data from gridded datasets in GRIB format. The resulting background profiles can be converted to a form suitable for use with the ROPP 1D-Var retrieval module ropp_1dvar. (2) A tool to read "grouped" EUMETSAT-style RO data in netcdf-4 format, and to output in standard ROPP or BUFR format. (3) The automatic calculation of dry temperature by tools in the ROPP pre-processing package ropp_pp, and its full incorporation within the standard ROprof structure. There are few other changes, so unless users wish to take advantage of these new features there is no need to update their applications to use this latest ROPP distribution. Details of all changes are available together with the updated software on the ROPP download website. Today the ROM SAF resumes the demonstration dissemination of the Metop-B refractivity products. The products will be level 2 BUFR files with a similar content as the current BUFR files from GRAS on Metop-A, i.e. they will contain the retrieved refractivities and a copy of the thinned bending angle that is disseminated by EUMETSAT CAF. More information is given in this UNS-message (requires login). Please do not hesitate to contact the ROM SAF team if you have any questions related to this. The ROM SAF is pleased to announce that our NRT monitoring page now includes GRAS RO data from the Metop-B satellite ("GRAS-B"). The EUMETSAT Central Application Facilities (CAF) started the dissemination of GRAS level 1b bending angle data from the Metop-B satellite on November 15. The subsequent ROM SAF processing into level 2a refractivities has been running since October and these products have now undergone validation. Today the ROM SAF starts a demonstration dissemination of these products. The ROM SAF recently created a twitter account: https://twitter.com/rom_saf. We intend to use Twitter for brief information about our UNS information and other news. EUMETSATs newest polar-orbiting weather satellite Metop-B was successfully launched from Baikonur in Kazakhstan on a Soyuz rocket on September 17. Metop-B's role is to ensure continuity of observations from polar orbit which are vital to Numerical Weather Prediction as well as climate and environmental monitoring. This service is currently provided by the first satellite in the series, Metop-A (launched October 19, 2006), which has exceeded its nominal lifetime. The value of Metop data for weather forecasting is illustrated by recent studies of the impact of various data sources (in situ, airborne and space-based) on the performance of 24-hour forecasts, in which Metop-A accounts for the highest level of contribution at 25%. Focusing on the contribution of data from individual satellites, Metop-A's contribution is nearly 40%, which is more than double the contribution of a polar orbiting satellite of the previous generation. Like Metop-A, Metop-B is carrying a GRAS instrument (Global navigation satellite system Receiver for Atmospheric Sounding), which will supply radio occultation data to the ROM SAF. The first test occultation from the instrument is expected on September 24, and commissioning and cal/val-activities will last until February 2013, whereafter the first ROM SAF GRAS products from Metop-B are expected to be declared operational and become publicly available. In parallel, ROM SAF GRAS products from Metop-A will continue to be produced, as long as this satellite is operational. The ROM SAF participated in the EUMETSAT Meteorological Satellite Conference held in Sopot, Poland, September 3-7, 2012. ROM SAF Global Climate Data Based on GNSS-RO Measurements. From March 1, 2012, the GRAS SAF has a new name: ROM SAF (Radio Occultation Meteorology SAF). The new name reflects the fact that the products and services are not limited to RO data from the GRAS instrument. The change of name also marks the beginning of the 2nd Continuous Development and Operations Phase (CDOP-2) for the SAF. Although www.grassaf.org will redirect to the new domain for some time, we encourage users to update their bookmarks, web links, etc. accordingly. The GRAS SAF is pleased to announce the sixth full release for the software deliverable 'ROPP', Version 6.0. The principal changes from the previous release, v5.0, are a consolidation of the ropp_pp module and a better thinning of occultations near the pole. Numerous bug-fixes and minor enhancements, particularly with regard to the building and testing of ROPP, have also been included. All user documentation has been reviewed and updated. Details of all changes are available together with the updated software on the ROPP download website. Users are recommended to update their applications to use this latest ROPP distribution. The GRAS SAF is pleased to announce the fifth full release for the software deliverable 'ROPP', Version 5.0. The principal changes from the previous release, v4.1, are the inclusion of non-ideal gas effects (compressibility factors) in the forward model and 1D-Var modules, and support for the ECMWF BUFR library. Numerous bug-fixes and minor enhancements, particularly in the ropp_pp module, have also been included. All user documentation has been reviewed and updated. Details of all changes are available together with the updated software on the ROPP download website. The GRAS SAF is pleased to announce that our NRT monitoring page now includes RO data from two more satellites: The Argentinian satellite SAC-C and the US satellite C/NOFS. The data are processed and disseminated by UCAR and are now on the GTS, though data since February 2011 are provided. The GRAS SAF is pleased to announce, that the following 1D-Var products have been officially declared operational: GRM-02 (NRT temperature profile), GRM-05 (NRT surface pressure), and GRM-07 (Error covariance matrix for NRT products). The following 1D-Var products have been officially declared pre-operational: GRM-03 (NRT specific humidity profile) and GRM-04 (NRT pressure profile). The products are expected to become available to users through dissemination and download in Q4 2011. The GRAS SAF is pleased to announce that our NRT monitoring page now includes RO data from the German TerraSAR-X satellite. The data, processed and disseminated by the GFZ, have an improved stratospheric bias from October 21 onwards. Corresponding ECMWF statistics are available. On September 6-11, 2010, the GRAS SAF co-organized OPAC2010 (International Occultations for Probing Atmosphere and Climate Workshop) together with the University of Graz. OPAC2010 comprised the Joint OPAC-4, GRAS SAF Climate, and IROWG-1 workshops, and was held in Graz, Austria. OPAC2010 was a successful forum for everybody interested in atmospheric remote sensing by occultation methods and/or the use of occultation data in atmospheric physics, chemistry, and meteorology, this time with special focus on climate applications. For program, abstracts, and presentations, please visit the OPAC2010 web page. The GRAS SAF is pleased to announce an update to the fourth full release for the software deliverable 'ROPP', Version 4.1. The principle change from the previous release, Version 4.0, is an update to the radio occultation pre-processing module to provide more robust processing of open loop data. Additional functionality to process GRAS occultation phase and amplitude data has also been included. The 1DVar module has also been updated to provide improved support in defining observation and background error structures, and to output additional diagnostic information. All user documentation has been reviewed and updated. Details of all changes are available together with the updated software on the ROPP download website. The GRAS SAF is co-organizing OPAC2010 (International Occultations for Probing Atmosphere and Climate Workshop) together with the University of Graz. OPAC2010 will comprise the Joint OPAC-4, GRAS SAF Climate, and IROWG-1 workshops, and will be held on September 6-11, 2010 in Graz, Austria. OPAC2010 will be an attractive forum for everybody interested in atmospheric remote sensing by occultation methods and/or the use of occultation data in atmospheric physics, chemistry, and meteorology, this time with special focus on climate applications. For more information please visit the OPAC2010 web page. The GRAS SAF is pleased to announce that the GRAS SAF level 2 NRT refractivity product (GRM-01) has been declared operational. This is happening in connection with an upgrade of the GRAS SAF operational processing software, which will significantly reduce the current bias in GRM-01 above about 30 km. The standard deviation above 40 km will in general be a little larger than before. The influence on the data below 30 km should be insignificant. The details of the change are described in the associated Validation Report (available at the Product Archive). The main thing is a shift from statistical optimization based on a 1-parameter background fit to a 2-parameter fit in combination with a global search in a library of climatological profiles. The statistical optimization used is known as optimal linear combination (OLC). Due to the change of approach in processing the data at high altitudes, some profiles are dismissed as outliers above 40 km, and they are not further processed. As a consequence the number of refractivity profiles after the upgrade will on average be less than before (a reduction of about 5%). - time_offset [Time offset for georeferencing (since start of occ.)] is currently incorrect and will therefore be set to missing value. - azimuth [GNSS->LEO line of sight angle (from True North) for the reference coordinate] will now be provided in 'atm' files. - Time increment [data field 29; descriptor 0 04 016] is currently incorrect and will therefore be set to missing value. - Bearing or azimuth [data field 36; descriptor 0 05 021] will now be provided. Until today the GRAS SAF refractivity product had the status of pre-operational (version 1.2). After the upgrade the refractivity product is now declared operational (version 1.3). The upgraded refractivity product is disseminated over the GTS and EUMETCast systems in BUFR format in NRT. It is also being archived at our website in both NetCDF and BUFR files for offline access. The GRAS SAF is pleased to announce the fourth full release for the software deliverable 'ROPP', Version 4.0. The principle change from the previous release, v3.0, is the addition of a new two-dimensional bending angle observation operator, together with the corresponding two-dimensional tangent linear and adjoint codes and I/O support. Additional functionality has been provided in the pre-processing of excess phase data to ionospheric corrected bending angle and refractivity profiles, including use of external navigation bit data (this algorithm has experimental status and is suitable for research use only), revised filtering algorithms and additional options for initialising the Abel transform. Output diagnostic and error information from any ROPP routine may now be controlled by the user. Dependence on the third-party udunits library has been removed. All user documentation has been reviewed and updated. Details of all changes are available together with the updated software on the ROPP download website. The GRAS SAF is conducting a new user survey, the questionnaire can be found here. Initially, email invitations have been sent out to 574 recipients. The GRAS SAF web site has undergone a major update. Notable changes are a modified look, individual product pages, and merging of the two previously separated parts www.grassaf.org and garf.grassaf.org. Users, who previously logged in to access the garf.grassaf.org part, will notice that login is now only required to download product, software, and documents. A new GRAS SAF report addressing the issue of refractivity coefficients has been published. The report is written by Sean Healy, ECMWF, and has the name "Refractivity coefficients used in the assimilation of GPS radio occultation measurements"
Summary: The sensitivity of ECMWF numerical weather prediction analyses to the empirical refractivity coefficients and the introduction of non-ideal gas effects in the bending angle operator have been investigated. A review of the literature on the refractivity coefficients suggests that the uncertainty in the values is probably larger than has been recognised. The results reinforce the need for new measurements of the refractivity coefficients at radio frequencies. The GSR 09 report can be viewed here. The GRAS SAF is pleased to announce an update release for the software deliverable 'ROPP', Version 3.0. The principle changes from the previous release, v2.0, is to provide functionality to process excess phase and amplitude time series to compute L1 and L2 channel bending angle profiles by geometric optics and wave optics methods. This complements existing functionality to compute ionospheric corrected bending angle and refractivity profiles from L1 and L2 channel bending angle data. Details of all the changes are available together with the updated software package on the ROPP download website. EUMETSATs web page has a feature on the GRAS SAF and our refractivity product this week. The GRAS SAF is pleased to announce that the product archive GARF is open for access to archived NRT data. Read more here. We are pleased to announce on 30 March 2009, the inclusion of new GRAS SAF products on EUMETCast. The GRAS SAF level 2 NRT refractivity product (GRM-01) is generated for every occultation in BUFR format. The product has "pre-operational" status. For further information, please consult the SAF web site via the link provided above. Access to the above product will be automatically provided for Member/Cooperating State NMS and registered manufacturers. Following the successful trial, it is planned to make the products available to the wider EUMETCast User community. The GRAS SAF is pleased to announce that the GRAS SAF level 2 NRT refractivity product (GRM-01) has been declared pre-operational. The product is disseminated in NRT via the GTS system and is in the final stages of being made available over the EUMETCast system; a separate announcement will be issued when this is ready. On Thursday this week we will open the GRAS SAF Archive and Retrieval Facility (GARF) where archived NRT data can be retrieved. The current level 1b bending angle is obtained by GO and cannot be recommended for usage below about 8 km; this is also true for the refractivity. The quality of the refractivity product can be seen in the attached figure which shows the global O-B/B statistics compared to ECMWF. The figure shows the O-B/B mean and standard deviation and the product requirements accuracies: threshold (green) and target (red). We are currently improving on the standard deviation and the bias above 35 km and we expect to be able to provide an updated product within 1-2 months time. On GARF we provide continuous NRT monitoring of the data quality and data flow. The monitoring does not only include MetOp/GRAS RO data from EUMETSAT and the GRAS SAF but also RO data from the following missions: FORMOSAT-3/COSMIC, CHAMP, and GRACE-A. The BUFR file that is being disseminated via GTS contains in addition to the refractivity product a GRAS SAF produced thinnned version of EUMETSAT's NRT level 1b bending angle. The thinning is consistent with the thinning algorithm applied by EUMETSAT. In order to start receiving the GRAS SAF BUFR file please follow the normal procedures at your organization. The files are generated at DMI and carries the WMO bulletin headers: "IUT[A-L]14 EKMI". For more information about the BUFR files please read this document. If you have questions please do not hesitate to ask us. Please address your questions directly to the GRAS SAF helpdesk by using this link: Helpdesk. The GRAS SAF is pleased to announce an update release for the software deliverable 'ROPP', Version 2.0. Details of the changes are available together with the updated software package on the ROPP download website. The GRAS SAF is pleased to announce an update release for the software deliverable 'ROPP', Version 1.2. The principle changes from the previous release, v1.1, is to increase flexibility to support other than the ECMWF NWP model levels, significantly decrease dependencies on 3rd party code and to fix some reported bugs relating to the processing of Level 1 GRAS data. Details of the changes are available together with the updated software on the ROPP download website. A joint ECMWF/GRAS SAF workshop on the assimilation of GPS radio occultation measurements was held at ECMWF in Reading, UK, from 16 to 18 June 2008. Read more here. The GRAS SAF is pleased to announce NRT monitoring of level 2 demonstration products based on pre-operational level 1b GRAS bending angle data from EUMETSAT. The GRAS SAF is pleased to announce an update release for the software deliverable 'ROPP', Version 1.1. The principle change from the first release, v1.0 is to make the code in general much more robust to non- nominal data inputs and to support new forthcoming RO missions. The v1.1 code has also been successfully tested with a wider range of compilers, so portability is significantly enhanced. The GRAS SAF is pleased to announce the first full release of the Radio Occultation Processing Package (ROPP-1 v1.0). The package provides software to support GRAS (and other RO missions such as COSMIC and CHAMP) data to be assimilated into NWP models, RO data file interfaces plus various stand-alone tools such as 1D-Var retrieval and BUFR encoding/decoding. Full documentation is provided. There are no charges for this downloading or using this package. The ROPP-1 software, test data, documentation and supporting items can be downloaded from the GRAS SAF Product Archive, from where ialso an overview document describing ROPP can be freely downloaded. In order to download the package components, you will first need to register as an ROPP user via this website. This is an automatic process and very simple and quick to obtain the access details. Users who have previously registered for the Beta release will need to re-register for the full release. When you have your access details, you will be able to log in and navigate to the ROPP downloads page where - for the first login only - you will be required to agree to the terms of a Software Licence. Please first look at the Release Notes which contain a description of the available files, the current status of the packages components and a quick installation guide. We thank you for your interest in ROPP and we look forward to hearing of your experiences in using the package. If you have any comments or questions about ROPP, please use the Helpdesk facilities.